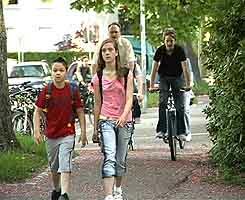 Many German children walk to school or ride their bikes along the cycle-paths. In Vauban, cars are not allowed into the alleys by the houses, except for unloading. Being green involves choosing energy-saving ways to travel. This section enables pupils to describe how they travel to school. They learn how to conduct a travel survey in German, and compare their answers with children at the German school. 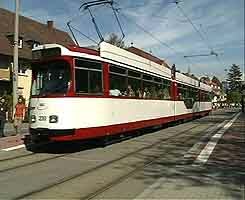 They can discuss which ways of travelling are better for the environment, and look at communities in Freiburg where people are encouraged to use cars much less. 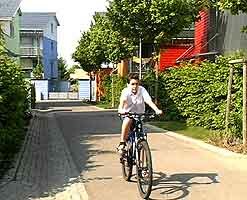 80 per cent of Germans own a bike and use it mainly to travel distances of less than five kilometres. They cover nine per cent of their total journeys by bike, and the German government's National Cycling Plan aims to raise this figure to eleven per cent by 2012. They will also aim to persuade car drivers to switch to cycling on journeys of up to five kilometres.